Work on the aircraft carrier will be completed at the Sevmash shipyard by the summer of 2013, followed by sea trials and the handover to India. The much-delayed handover of the INS Vikramaditya aircraft carrier will take place by the end of October 2013 with New Delhi and Moscow approving the final tasks and schedules on the refurbishment. “Russia and India have finalised and approved the list and work schedules to complete the refurbishment of the Vikramaditya aircraft carrier, which will be handed over to the Indian Navy,” Rosoboronexport spokesperson Viacheslav Davidenko said. “Work is ongoing and is due to be finished by the end of 2013,” he said, adding that the Vikramaditya would be put to sea once again for trials in the summer of 2013 after the boiler system is repaired. Related: $1 billion Indo-Russian defence deal in pipeline? This Vzglyad newspaper earlier quoted the Indian Defence Minister A. K. Antony as saying that the Ministry set late 2013 as the final deadline for the handover of the Vikramaditya to the Indian Navy. “The delivery of the ship is already five years behind schedule, so the final deadline is the end of next year,” he said. President of the Unified Shipbuilding Corporation Andrei Dyachkov said in late October that Russia would hand over the Vikramaditya to India by the end of October 2013. Russia had earlier refused to pay India an estimated $115 million in compensation for the delay of delivery. India was originally to get the Vikramaditya back in 2008, but delivery was then postponed until this year. It transpired in October that the customer would not be able to get the battleship before 2013 because of problems with the boiler system. 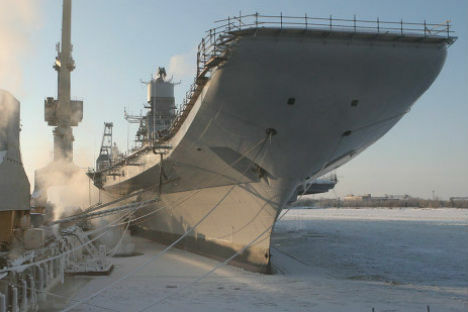 The shortcomings are to be eliminated at the Sevmash shipyard in Severodvisnk by the summer of 2013 after which, sea trials will be held in the summer and the ship will to be handed over to the Indian Navy in the fourth quarter of 2013. The contract to refurbish the aircraft-carrier formerly known as Admiral Gorshkov was signed with India in 2004. After profound modernisation, the Vikramaditya will become the Indian Navy’s flagship.